Suiseki is the Japanese art of stone appreciation. Formed over centuries by wind, water and erosion, viewing stones are valued for their distinct shape, color and texture. Viewing stones take many forms including distant mountains, plunging cascades and other natural wonders. Traditionally, they are placed on a fine bed of sand in shallow bronze or ceramic trays creating distillations of nature enjoyed indoors. 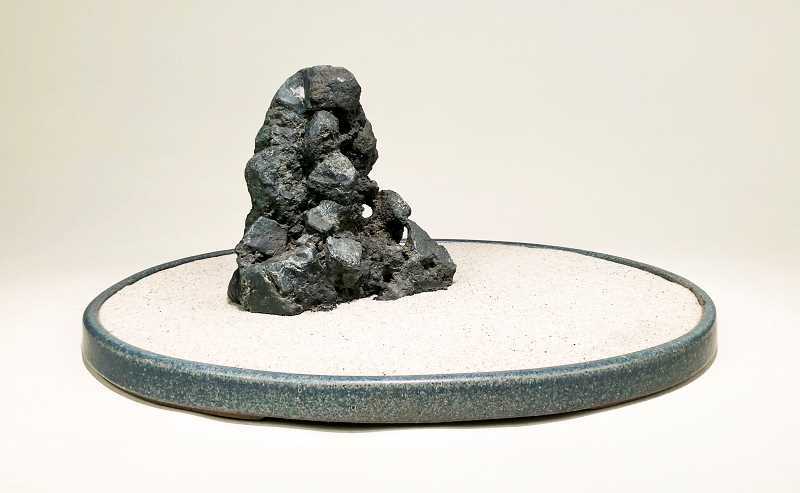 The Ice and Stone Suiseki Viewing Stone exhibition at Portland Japanese Garden (Feb. 9 through March 24) features dozens of pieces from the Jim and Alice Greaves collection at the prestigious Huntington Library, Art Collections and Botanical Gardens in San Marino, California. The exhibition is curated by Huntington Cultural Curator, Robert Hori. "Since ancient time, people in Japan have found beauty in rocks and cherished them for their unique patterning. They evoke the grandeur of nature," said Hori. To commemorate this year's 60th anniversary of the sister-city relationship between Portland and Sapporo, located on the island of Hokkaido, the stones are paired with black and white photography of rugged Hokkaido landscapes by Northwest photographer Michael Kenna. The commonalities of Portland and Sapporo remind viewers that the Pacific Ocean is not a barrier but a bridge between the two countries. Ice and Stone is the first of four Art in the Garden exhibitions of 2019. It is included with garden admission (adult $16.95) and is on display in both the Tanabe and Pavilion Galleries. Portland Japanese Garden is a 501(c)(3) nonprofit organization. Since opening year-round to visitors in 1967, the garden has been immersing its guests in beautiful scenery while they experience the art and culture of Japan. Celebrated as one of the most authentic Japanese Gardens outside of Japan, the Portland Japanese Garden features eight separate garden styles on its 12-acre site.